ItalDesign: "To mark 50 years of activity in the world of car design, I decided to sculpture a Ferrari to the memory of that great adventure and enjoy it with my family". -Giorgetto Giugiaro fashioned and commissioned a project that spilled into stretching horizons, in that he became concurrently - for the first time ever -supplier and customer of the new car. Rather than being a spellbound step into tomorrow, the ultimate outcome of all this is an expression of today - a Ferrari graced by his initials, GG, followed by the digit 50 by way of epitomizing his debut into the world of car design in September 1955 -imbued by an imposing, unmistakable artistry capturing sky-high ergonomics and outstanding space on board. 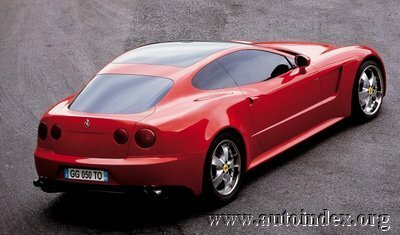 Created along the lines of the Ferrari 612 Scaglietti, and retaining the same basic mechanics, the Ferrari GG50 is a little shorter in length than the original model, with a fastback tail conspired to conceal the underlying hatchback lid. The rear seatbacks can be folded down to create, thanks to the new fuel tank, a flat trunk platform one meter and 40 centimeters deep. All that was checked and verified with the Ferrari Technical Direction support. GG 50 Philosophy The idea of creating a Ferrari to mark 50 years of activity in the world of car design took shape in September 2004 at the Paris Motorshow, where Giorgetto Giugiaro talked about this flight of fantasy directly with the President and CEO of Ferrari Luca di Montezemolo who cued the model around which the vehicle concept should be developed: the 612 Scaglietti 12 cylinders four-seater coupé. Montezemolo also gave Giugiaro two inputs: although no restrictions would be posed on creative-thinking, the vehicle must be perfectly in keeping with the Ferrari tradition and transmit a sensation of compactness, even being highly enjoyable. Redesigning the Layout Retaining the wheelbase at 2.95 meters, the Ferrari GG50 spans 4 meters and 81 centimeters in length vs.4.90 for the Scaglietti. Giorgetto Giugiaro reinterpreted the front just a little, pruning the front overhang by 2 centimeters. On the other hand, he revolutionized the rear section, nipping the overall length of the car by 9 centimeters. In the Scaglietti, the fuel tank is positioned vertically, behind the rear seating. For the Ferrari GG50, Italdesign engineers were asked by Giugiaro to concentrate on positioning the new 95-liter fuel tank entirely below the trunk platform line. With the rear seatbacks folded down, the redesigned fuel tank layout translates into a flat trunk platform one meter and 40 centimeters deep. Compared to the 240-liter loading capacity of the Scaglietti, the loading capacity offered by the GG50 stretches to 270 liters, which, with the rear seatbacks folded down, increases to 500 liters. In a strategic intent to take full advantage of the bolt-on loading space driven through by the new fuel tank layout, Giugiaro decided to use a proper hatchback lid, hinged to the roof's edge. From a structural standpoint, Italdesign engineers had to redesign the rear cross-member which, in the Scaglietti, joins the suspension domes atop the fuel tank. Likewise, also added to the roof's edge was a cross-member, joined to two reinforced risers, to stand the hatchback trunklid's weight. The more instantly recognizable makeover is the tail's sleeker shape, where the rear profile has been nipped 7 centimeters. GG 50 Exterior Design Although being 9 centimeters shorter than the Scaglietti, the Ferrari GG50 appears instantly to be even more compact than the series-production car as a result of the subtly rounded nose and tail angles. "In bird's view, all cars look like a rectangle", explains Giugiaro. "As a consequence, the dimensions are perceived optically as being the same as the maximum length". In the GG50, however, Giugiaro rounded to an extreme the loop between the cowl and the front wheelhouse, applying the same treatment to the rear. From a structural architecture standpoint, the GG50 relinquishes the Scaglietti's third compartment for a nimbler tail, an instantly recognizable fastback. A very bold statement of performance and design is the general impression perceived. A compact coupé, ready to bite the grit, with the rear seats so well concealed as to be perceived as a classic two-seater. The bodyside is immaculate. The air intake - providing cool air for front brake system cooling - meanders along almost in parallel with the ground line and creates a bas-relief that fades into the rear. As for the more stunning Ferrari cars, the belt line arches in correspondence to the rear wheel highlighting the generous wheelhouse's taut muscle. The boldly tapered rear profile gains form and shape from the side view, in that emerging from the tail-end mirror are the dual tail lamps, which, of course, are round. Absolute simplicity in the front as well. 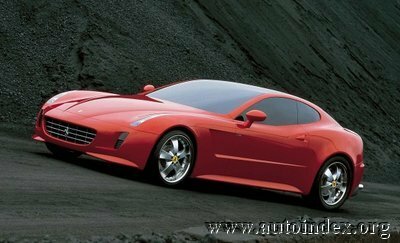 With the low-slung Ferrari grille looking just as fresh and fun loving as ever, the nose flares forward in the center with two generous and vertical air intakes unfolding to the side, where the fog lights are housed. The headlamps are vertical, a stroke of pen that translates into a black crescent moon housing XENON headlight beams and dimmers, and the turn signal indicators. The long bonnet is creased almost imperceptibly by a V, which makes the volume more plastic without, however, disrupting the natural flow of the lines. Likewise simple is the tail, with the lower section, housing the chrome dual exhausts, black-painted to reduce the overall sensation of height. Incorporating LED technology, the round dual lamps are asymmetric, with those to the side playing a master role. Set at the forefront, the chrome Prancing Horse. The crest of the trunk rises towards the center contouring a small spoiler to provide extra downforce at the rear and insure the car is stable at high speeds. Practically imperceptible is the hatchback door. The GG50 seems to have a classic trunklid hinged under the rear window. However, the rear window as a whole lifts up along with the trunklid and, as such, is a proper hatchback door. In bird's view, the elements that dominate are two: the boldly tapered four extremities and the photochromic roof, which, with the fender, creates a seamless transparent surface. GG 50 Interior Design Whilst the GG50's exterior drew breath from a universal chalkboard, its interior was fashioned as the mock-up progressed. In addition to retaining as mentioned earlier the wheelbase, also retained was the interior appearance of the Scaglietti. However, when working on the full-size mock-up, Giugiaro and his son Fabrizio, decided to eliminate the closed-in feeling back in there by sloping the rear window at the side. Taken as a whole, the instrumentation is the same as the one to be found in the series-production car. Brand new is the dashboard, fitted in the center of which is the AVIC - X1R satellite navigator by Pioneer. Fitted inside the central console, whether between the front or rear seats, are two generous storage pockets, duly protected by a flap. Decidedly unusual for a Ferrari in these times, the door panels, featuring a large glovebox, have a horizontal natural beech insert. Covered in beige leather, the seats use the structural frames found in the production car. The upper section of the rear seatbacks can be folded down, thereby creating a flat loading platform at the same height as the new fuel tank. 2005-10-18 Please quote Autoindex.org if You use this news article!